One of the many reasons that a study of ancient Egypt is so interesting is the abundance of fascinating cultureal artifacts surrounding their beliefs in the afterlife. Bobby and I could not resist the temptation to expand our focus on one god in particular- Anubis, the jackal god of the afterlife. 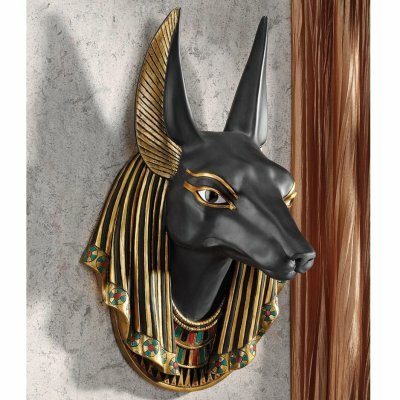 Anubis is the Egyptian god of mummification and governs the Pharoah's journey into the afterlife. He is also the patron god of lost souls and the helpless. He is one of the oldest gods of Egypt, who most likely developed from the earlier (and much older) jackal god Wepwawet with whom he is often confused. 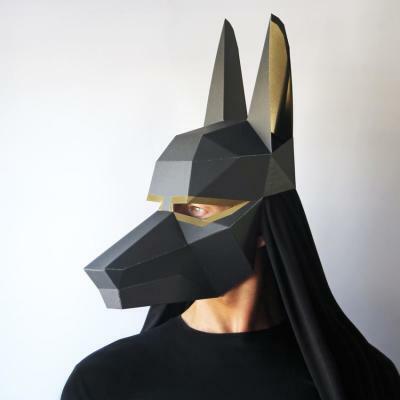 Anubis' image is seen on royal tombs from the First Dynasty of Egypt (C. 3150-2800 BCE) but it is certain he had already developed a cult following prior to this period. He is often found on the wall's of tombs for protection of the dead. A quick scan of the Internet revealed a number of different mask designs ranging from the more traditional appearance to an almost alien, renegade biker configuration. 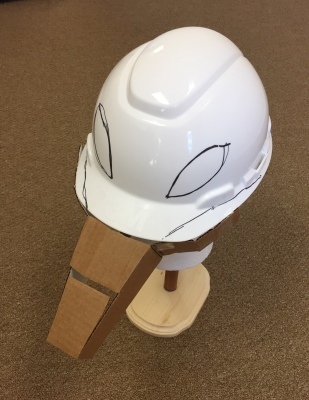 Ideally, we would like our mask design to fall somewhere in between historical accuracy and "Cosplay Cool". 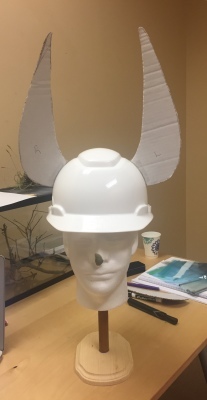 We are going to use sculpting foam for the ears, snout and forehead secured to the contractor's hat for comfort and support. Generous amounts of fiberglass cloth/resin will be used as well as Evercoat premium body filler. 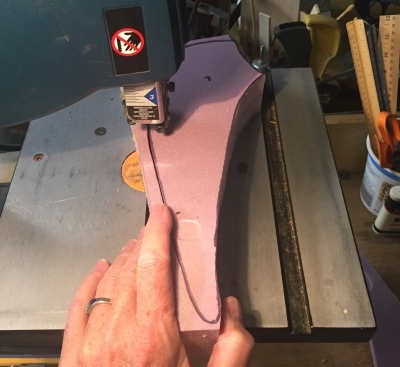 EVA foam will be used for the headress. May the Gods favor our design and grant us relief from our suffering! Anubis has a very elongated nose with a pair of really, really large ears. 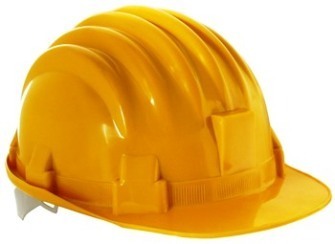 We are going to use a contractor's hat as a base for our design. Sculpting foam should help to keep the weight down and its easy to add contour to our mask. 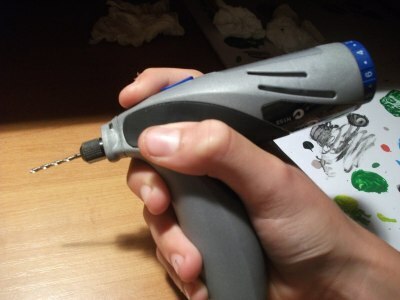 It's also easy to cut and sand. 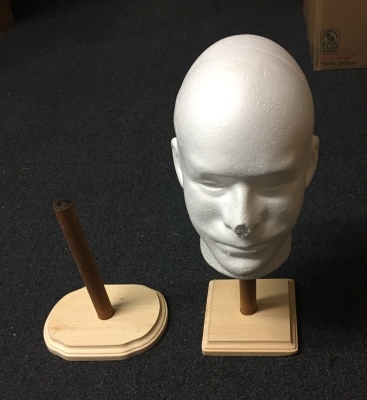 The first step in our construction is to use carpenter's glue to secure a foam head (Michael's) to a wooden base (Michael's) using a 3/4 inch wood dowel. 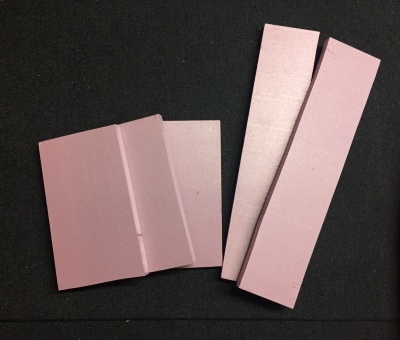 Next we cut our pink foam board into smaller strips and laminated them together. 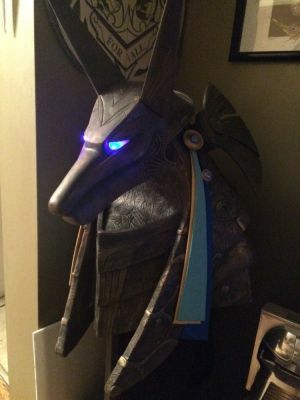 The longer strips will be used for Anubis' ears are about ten inches long. Glue, clamp and let dry overnight. 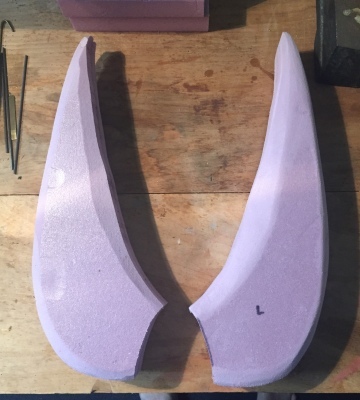 Bobby and I made templates of Anubis' ears out of cardboard and then transferred the pattern to the pink laminiated foam. A few passes under the scroll saw yielded some impressive results. These will be sanded and shaped for a more realistic contour later on in the project. 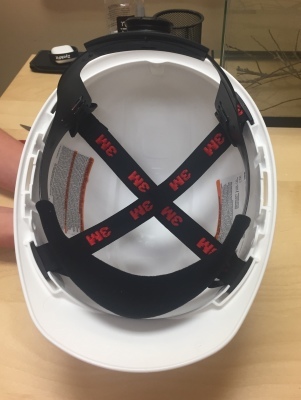 Our white contractor's hat came with an adjustable head band which provided a really secure yet comfortable fit. 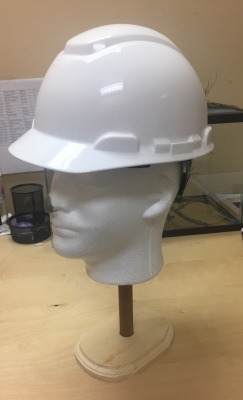 We will use the plastic hat as the base for our mask construction. 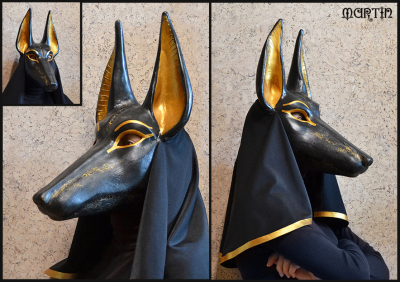 Once we attached the head band, we made a mockup of Anubis' snout or nose using spare pieces of cardboard. We also decided that the hat must be trimmed for a leaner look. 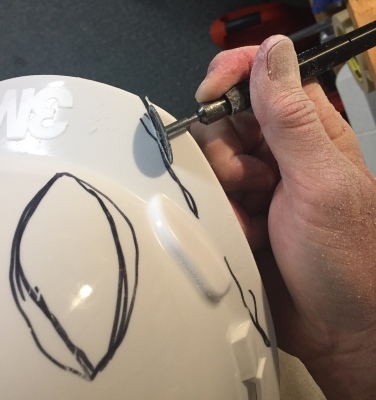 We used our Dremel stylus and a cutting disk to remove excess plastic around the sides and top visor.